Last weekend I was fortunate to attend an Aunkai Study day conducted by Liam O’Donoghue and hosted by Filip Maric of Calm and Storm Martial Arts Auckland. During the day, we focused on core fundamentals of Aunkai, including stepping and kicking to name just a few. But what is Aunkai? 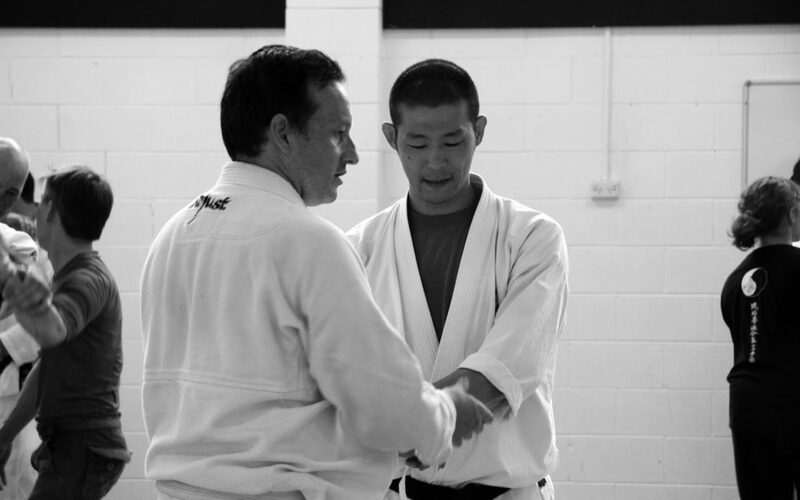 Aunkai is new training method founded by Minoru Akuzawa Sensei. Akuzawa Sensei has an extensive background in martial arts. It is clear that internal martial arts have had the most lasting impact on him as he has made this the sole focus of his training. So while Aunkai itself is new, the ideas and skill sets go back many centuries. To many, the term internal martial arts brings to mind images of supernatural abilities and chi blasts. For the most part, however, internal martial arts are simply the correct use of alignment and body mechanics to produce force far more powerful than what you would otherwise be able to achieve by overtly muscular force. Aunkai is effectively a method that streamlines this skill development. While it can take internal martial artists decades to begin to achieve, Aunkai chases these abilities from day one in a straight-forward and no-nonsense fashion. It is almost completely devoid of any technique or application. That said, once one has a foundation in these skills, they become the core or engine from which almost all martial techniques and interpretations can be applied. With this engine behind it, the same techniques will now be way more effective and powerful. In my own journey of Wing Chun study, I have seen first hand the advantages of an internal focus. I used to train a version of Wing Chun that was very technique oriented. One day, I came across a little-known group of Wing Chunners that had a more internal focus. They were from the Chu Shong Tin lineage of Wing Chun. When I practiced Chi Sao with them (sticky hands), I immediately noticed the difference. These guys would cut through my structures with relative ease and I found myself having to move twice as fast as them to compensate for my own lack of structure. While it felt forceful, they appeared to be way more relaxed than me. Having an integrated body and structure meant they were able to take a more direct approach where I had been trained to go around. The problem with the “go around” or “divert the force” approach found in many Wing Chun schools and martial arts, is that you never get to develop the knowledge and body awareness of what to do with pressure and how to move the body and limbs in ways that integrate your mass to their potential. When I tried to explain this to my old Wing Chun classmates, they disapproved and thought that force on force meant activating muscle and using strength. This is a misunderstanding. I would like to dispel a myth about internal martial arts. When you see it in practice it looks very soft and gentle. However, to be on the receiving end of it can be one of the most brutal things you will ever feel. There are probably many ways internal martial arts can be expressed. However, in the case of the Wing Chun group I came across, one of the first things I noticed was the shock to my limbs and my spine. 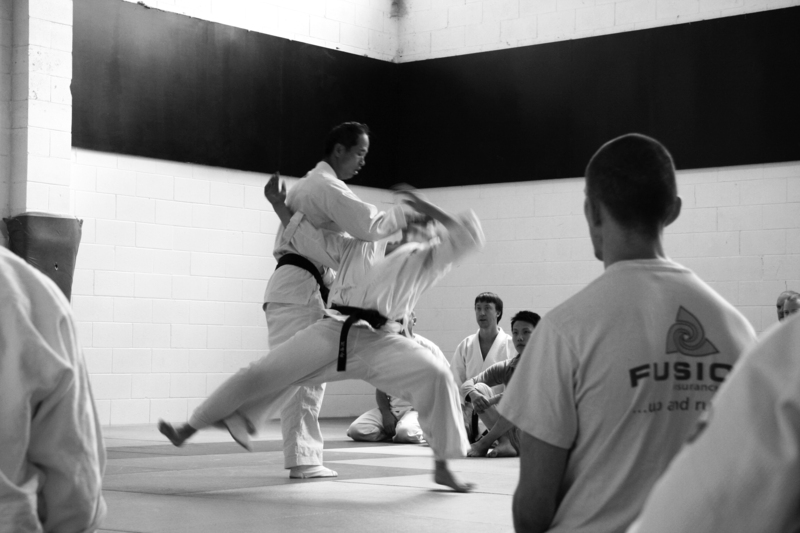 The second time I felt this type of force was with Akuzawa Sensei, the founder of Aunkai. Having to move back to Japan from NZ for family reasons was unfortunate because I had to end my Wing Chun training. In Tokyo it was hard to find a martial art with a similar approach, so I joined a BJJ school. I kept my eyes open and eventually my search led me to the Aunkai dojo in Tokyo. Meeting Akuzawa sensei was amazing. He made me and another newcomer face each other and grasp each other’s hands strongly. He then gently placed his hand over ours and suddenly brought his arm down. Our arms were brought down with such force that it caused my head to whiplash forward. It was quite a shock to my nervous system and spine. I knew then that Aunkai was what I had been looking for. Classes were informal by Japanese standards. We started out with the Aunkai exercises of Tenchijin and Shiko. We then did partner drills like push out and pad work. Towards the end we practiced Randori, which is a sort of light sparring that includes throws. Each training session was followed up with a few beers and snacks at the local Izakaya (Japanese bar). It is here that Akuzawa Sensei’s character comes out. He will talk about anything and everything, but his enthusiasm for the martial arts is infectious. One of the things he joked about was the large number of foreign students he has at his school. “I don’t why I am attracting so many foreigners to my classes. I don’t even speak English!” he laughed. His students, who were indeed mostly western, all had extensive experience in other martial arts and were passionate about the benefits of Aunkai. I found Akuzawa Sensei’s personality and approach to martial arts quite refreshing. One of the ways he stands out from other internal martial artists is in how dynamic and explosively fast his movements are. Another difference is his belief that internal martial arts can be applied in competitive fighting arenas. He himself has had extensive competitive fighting experience and he encourages his students to get out and compete in anything from Sanda to K1. One of his students I spoke with regularly fought in amateur heavyweight K1 tournaments. Unfortunately, I had to return to Auckland before I could really get going in Aunkai. While I kept up my Wing Chun and BJJ. I kept contemplating Aunkai and stayed active on the Aunkai forum. Wherever I could, I would find friends to practice standing push out with. I would regularly check the internet to see if anyone was practicing Aunkai in Auckland. Fortunately, my persistence paid off and I found a reference to Aunkai on Filip’s Calm and Storm Martial Arts website. I quickly emailed him and got a speedy reply. It was great to make contact with someone who shared my enthusiasm. 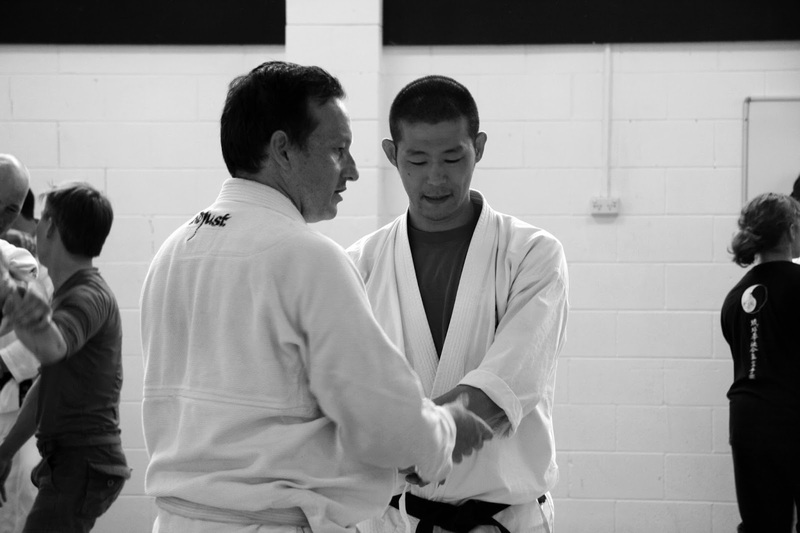 Filip organized Akuzawa Sensei’s first visit to NZ in November 2014. I attended the two-day seminar in Auckland, which was amazing! About a week after the seminar, certain things started to click for me and I was able to do some of the more advanced Wing Chun structural tests with ease. 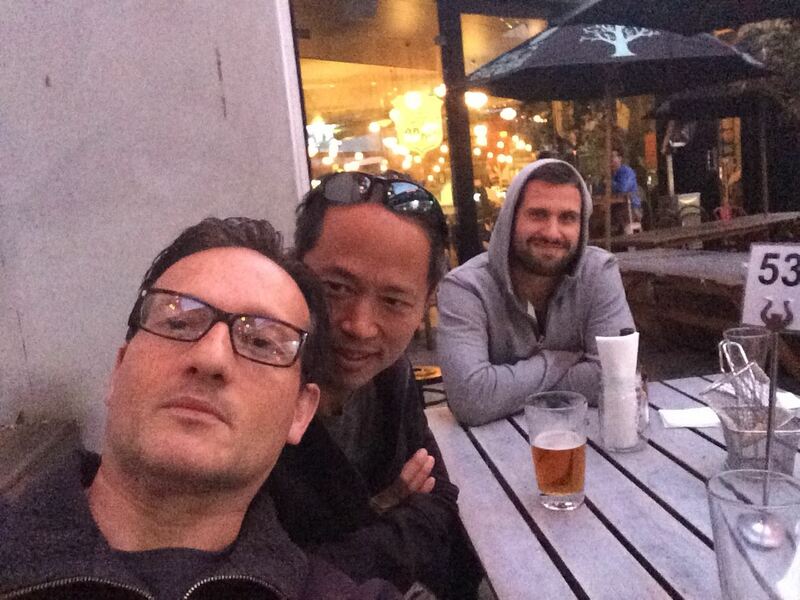 Filip was also inspired and got to spend a lot of time with Akuzawa Sensei during his stay here in NZ and since then there are two Aunkai study groups in New Zealand, one in Christchurch and one here in Auckland (training every Thursday evening at Jikishin Dojo). At the moment classes are still small, but I am finding them extremely rewarding and love the fact that we are keeping up and developing our Aunkai skills for the next time Akuzawa Sensei and/or other instructors might come to visit. Filip himself is very open-minded and we both appreciate each other’s arts. Aunkai bridges the gap between our two arts and thanks to Filip, I am able to see a side of Aikido that I was unaware of. Internal martial arts is an incredibly rewarding journey of never ending realization and discovery. Having Liam conduct the Aunkai study day last week opened my eyes and body to even new depths of understanding and possibilities. Liam, like Filip, is extremely committed to his Aikido training, as well as Aunkai. He has just recently returned from a four-day intensive Aunkai seminar instructed by Akuzawa Sensei, at Philippe Orban Sensei’s dojo in Leipzig (a high-grade Aikido instructor who will be returning to NZ for a series of seminars later this year). The Auckland study day was attended by people with a variety of martial art backgrounds, but the thing that struck Liam the most was how open minded this group of students was. I believe there is an emerging martial art movement where more and more people are becoming inspired by the possibilities of internal martial arts and how it can benefit their practice. I have no doubt that Aunkai’s popularity will continue to grow both in New Zealand and abroad. If this sounds like your cup of tea, why don’t you join us on Thursdays at Calm and Storm Martial Arts? We would love to have you there!